Pity the poor rhythm guitarist. I mean, who wants to be rhythm guitarist, right? Hell, not me! Well, yeah, actually, me. No qualms about it either. Don’t get me wrong, I love to take a lead every now and then, but I don’t fall into the trap of labels and expectations. What am I talking about? I used to work in personnel. In a personnel agency, I should say. I was what we call here in the States “a head hunter.” One of the things that amazed (and, to be frank, amused) me no end was just how many people disliked their jobs because they weren’t being “creative.” And it was very, very hard to nail down just exactly what being “creative” meant. They wanted to work in ad agencies or marketing firms or what have you. Mind you, sales, which is probably the most creative of careers, was always out of the question. I currently work in an advertising agency. Like most big agencies, the actual “creative” work (not to be confused with the ads or commercials themselves) is done by a handful of people. The rest of us (and note I’m included in “us”) are basically the support group. But this is not to say that we are not ourselves engaged in creative activities. Far from it. But it is a creativity that is not measured by the same standards as what we consider “Creative.” Many people make the mistake of identifying creativity as an end product and not as a process. In most circumstances, a lead guitarist can rarely do anything without his (or her) support group. Again, this is not in any way meant to be disparaging. But think of the great guitarists you know and admire. Now think of how many times you’ve ever seen (or heard) any of them play solo. That’s “solo,” as in without any other musicians. And way too many solos (“leads” this time) are simply riffs and scales strung together. The only actual thought that goes into them is in deciding in which key a song is being played and selecting which of the countless memorized (or pre-programmed) riffs will be used. But this argument is actually a smoke screen. I want you to think about what guitarists do. Is a rhythm guitarist any less creative than a lead guitarist. Or a bass guitarist, for that matter? Ultimately it depends on the person and not the label that we put on him or her (or ourselves). The creativity is in what they do. And often the hardest thing involving creativity is approaching a very simple song that has been played to death. The steps to being a good guitarist are many and nowhere does it say “hey, you’ve only been playing for such and such a length of time, so stick to a simple, straight strumming pattern.” What I want to do today is look at a song that would be very easy to just write off as just another of these Songs For Beginners pieces and see what being creative is all about. 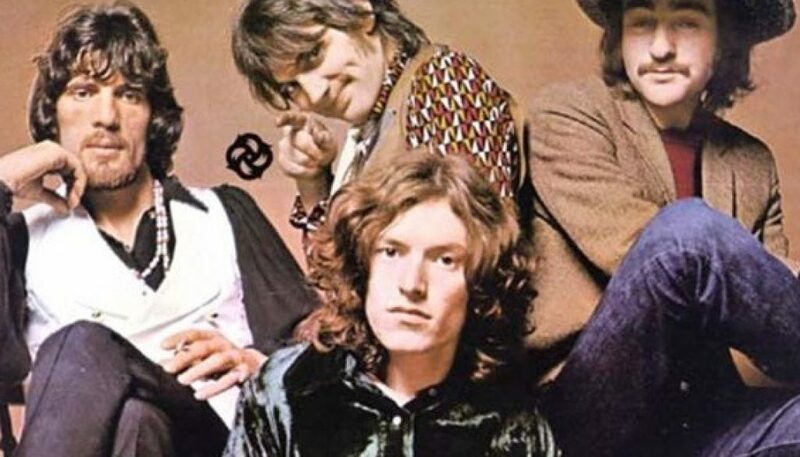 “Feelin’ Alright” is from the 1968 self-titled album by Traffic. It was written by Dave Mason while a member of Traffic during their classic line-up of Dave Mason, Steve Winwood, Chris Wood and Jim Capaldi. For a lot of people, the song is known by Joe Cockers version from 1969. The song has also been covered by Grand Funk Railroad, Isaac Hayes, The Jackson Five, Three Dog Night, Paul Weller and Freddie King. What I particularly like about this song is how you can do so many things with it simply from a rhythm stand point. You can play it straight ahead folk, using the same strumming patterns we learned in Horse With No Name. You can also give it a percussive strumming pattern, like we used in For What It’s Worth or even more of a driving rhythm. A “one and a two and a three…four and a one…” sort of deal. That actually makes for quite a difference in tone, doesn’t it? Funkier, perhaps? Maybe “bluesy” would be your term of choice. Anyway, here we go. Since I often have to play on my own without a band, I tend to look at my rhythm playing as having to compensate for both the bass player and the lead player being AWOL. Usually I will do this by trading off a bass part with a lead riff. We’re going to work this very simply in order for you to get the hang of it here and now. Since the song has only the two chords and since those chords are E7 and A7, the bass part can be ridiculously easy. Just use the open E (low E, naturally) and A strings. Now last spring in the column Tricks of the Trade we talked for awhile about what I called “the amazing second fret.” You can really accomplish a lot with the guitar if you know where your notes are and the real difference between an E and an E7 (or an A and A7) is simply in the fact that you have one string open instead of playing the second fret. Bonus points for all of you who want to go and tell me which note is involved in making either seventh chord! Notice how the natural ringing of the strings keeps the rhythm flowing. You actually get a lot of flow from one note to the next. We can also punch this effect up a bit by adding a partial chord on the fourth beat. So who says a two chord song has to be boring? Like anything, it all comes down to what kind of effort (or inspiration, if you prefer) you decide to put into it. Creativity is whatever you bring to the table. It is what you do with something and not just something you do.